Through her art Nora Summers sought a personal vision of Arcadia. She was receptive to the bucolic spirit of the artistic circles in which she moved, and absorbed something of the vivid Post-Impressionism of J.D. Innes, Augustus John and Derwent Lees. Her work often has a sense of hermetic stillness: of frozen time, of unemphatic yet implicit personal allegory. Nora’s striking looks and modernist dress sense appealed to her contemporaries and she was painted by artists such as Augustus John, Henry Lamb and Walter Russell. Born in Bristol on 19th March 1892, she was the daughter of Florence and Edward May Munro-an electrical engineer and inventor of tramway pantograph systems. Nora went to Bristol School of Art before enrolling at the Slade School in London where she studied under the formidable Henry Tonks from 1907-1910. She became friendly with J.D. Innes and Derwent Lees and met a fellow student, Gerald Summers (1886-1969), whom she married in September 1912 at Chelsea Old Church. A prolonged honeymoon in Italy followed (1912-1913) where both artists worked closely together on topographical paintings and etchings of Italian cities. On their return, they lived intermittently at 118 Cheyne Walk, Chelsea. Nora and Gerald spent the summer of 1914 in a caravan hauled by a huge white horse near Creech in the Purbeck Hills in Dorset where they painted with Derwent Lees. Impending war and the locals’ fear of spies brought an untimely halt to this Purbeck sojourn-as Gerald recalled, ‘With our unconventional appearance, we became a source of curiosity to the natives and of mistrust to the police’. Nora travelled to Ireland in 1915 and visited Lady Gregory at Coole Park. From 1914, Nora became a frequent visitor to Augustus John’s extended household at Alderney Manor overlooking the Purbecks in Dorset. There she photographed the John and Macnamara children while forging lifelong links with both families, especially Yvonne Macnamara, who became for Nora a companion, lover and muse. 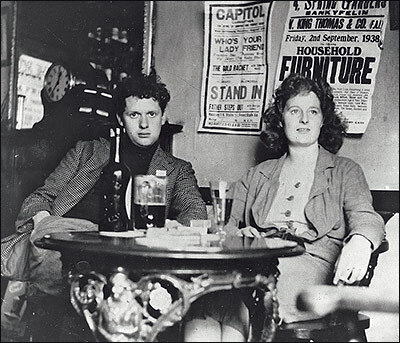 Her children were John, Brigit, Nicolette and Caitlin, the future wife of Dylan Thomas. Nora was inspired by the Alderney example of communal living. Nora and Gerald set up home together with Yvonne and her young children, in rented accommodation at Lulworth, Corfe Castle and New Milton in Hampshire. Nora introduced a menagerie of dogs, cats, chickens and herds of British Alpine goats. These prize goats were pampered by long-suffering ‘goat girls’ for agricultural shows which became for Nora a passion. When Nora’s only son Vincent was born in London in April 1919, she had the road outside Cheyne Walk strewn with straw to dull the noise of the traffic. Escape was essential. Soon installed at New Milton with the Macnamaras, Yvonne assumed the maternal role while Nora painted. Celebrating the birth of her child, Nora painted a series of flower paintings and maternal groups involving Yvonne and baby Vincent in 1919. In February- March 1920 she had a solo exhibition at the Chenil Gallery in Chelsea. From 1911 Nora had shown her paintings regularly at the New English Art Club and occasionally at the Walker Art Gallery, Liverpool. Her work was promoted in Colour, an art magazine of the period, and she was represented in the Whitechapel Art Gallery’s exhibition of May/June 1914, Twentieth Century Art: A Review of Modern Movements. She was a Francophile interested in Post-Impressionism and her son Vincent was so named in tribute to Van Gogh. After 1923, when the Summers’ acquired a rambling farmhouse at Ferndown in Dorset, life became more settled. The families of Augustus John and Henry Lamb were nearby and Yvonne Macnamara lived at Blashford, Ringwood, five miles away. Nicolette Devas recalled Ferndown as a setting for lively art discussions, with Lamb’s enthusiasm for Stanley Spencer infecting everybody. Nora enjoyed entertaining the young artistic friends of the Macnamara family, Anthony Devas, Rupert Shephard, William Townsend and Dylan Thomas. She encouraged Nicolette to paint, and Caitlin to become a model for her. Nora appreciated Caitlin’s love of performance and instinctive physical response to nature and took a series of photographs of her muse dancing and posing in various ‘attitudes’ on the banks of the river Avon. Throughout the 1930s photography became increasingly important for Nora after she acquired a Roliflex camera. Favourite photographic subjects were the Swannery at Abbotsbury and informal portraits of the younger generation. From 1936-1938 she took a series of photographs of Dylan and Caitlin. These were taken at the home of Caitlin’s mother Yvonne Macnamara at Blashford and at Laugharne. At Brown’s Hotel in 1938, Nora took an iconic photograph of Dylan and Caitlin, which would become one of the most widely reproduced images of the poet. Another of Nora’s photographs of Dylan, the poet sent to his friend Vernon Watkins in 1938, ‘Here is a photograph taken by a woman near us. It’s one of many: this is the toughest’. The photograph shows Dylan smoking, ‘you can write a poem on the back, draw whiskers on it, or advertise Kensitas in the front window’. 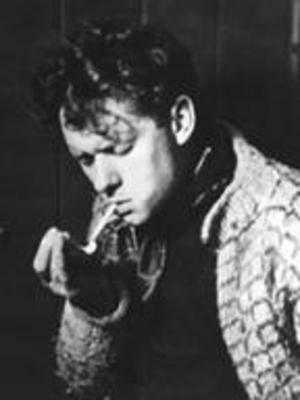 Vernon used the image as the frontispiece to his book, Dylan Thomas Letters to Vernon Watkins (1957). Nora’s photograph inspired Vernon to write his poem, ‘Portrait of a friend’. While Nora occasionally submitted photographs to competitions or shows, they were essentially informal and private family images, not created with a view to celebrity or publication. The war in 1939 bought an end to this bucolic existence and Nora became an alcoholic. She had by the end of the war given up both painting and photography, and died of a stroke in 1948.